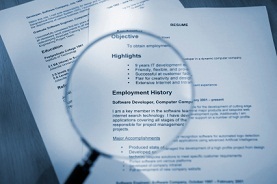 Using the proper resume format is the key to landing a new job. You only get one chance to make a first impression on a prospective employer, and your resume is usually that one chance. Resume writing can be uncomfortable for many job seekers, and downright terrifying for others. However, if you have a good handle on proper resume format, the rest of your resume will just fall into place. We've put together a list of the key components in a proper resume format to help you get started and take the guesswork out of the resume writing process. Paper: Use a standard, heavier weight paper for your resume. Many office supply stores carry paper that is made specifically for use on a resume. Avoid cheap, lighter weight papers. And always avoid colored paper, colored ink, graphics and pictures, and other customizations that can look unprofessional. Length: The standard length for a resume is one to two pages. The only time you should ever exceed this limit is when you are applying for a very specialized job or are writing a curriculum vitae. Depending on how long one has been in the workforce, one or two pages is sufficient for most resumes, however. Margins: Your resume should have a margin of 1-inch or 1.5-inch on the top, bottom, left and right margins. This gives a clean look and makes your resume easy to read for the hiring official. Font and Spacing: Use single spacing between lines on your resume, with double spacing between entries. Times New Roman, 12 point, black, is a popular resume font. Separate each job, skill or work experience with a double space. Once you have the basic skeleton for your resume, you have to pick out the resume format or resume template that you are going to use. There are three popular choices - functional, chronological and combination resume formats. The functional resume lists your work, education and skills by category, keeping like items with like. The chronological resume lists work, education and skills in chronological order, starting with the most recent first. The combination resume combines the functional resume and the chronological resume. A combination resume lists skills and education first in chronological order, followed by work experience in chronological order. There is no "right" resume format, the format you choose is completely up to you and what fits your particular needs. Using the proper resume format will allow your resume to be easily read by a hiring official. Many companies use computerized software to scan resumes for important information that will match you to a particular job and help the computer pick out the keywords it is looking for. At GoGetterCareers.com, we can connect you with a professional resume writing service. Our team of affiliate resume writers can help you write and format your resume and get it ready to be seen by a prospective employer. You may also want to utilize the resume builder on our site and/or reference our free resume templates. Other sample resume examples can be found under Resume and Cover Letters . Contact us today to see how we can help you! RESUME TYPES: CHRONOLOGICAL, FUNCTIONAL, COMBINATION - How to choose what type of resume to create. LIVE CAREER RESUME BUILDER- Build an effective resume with this resume builder.